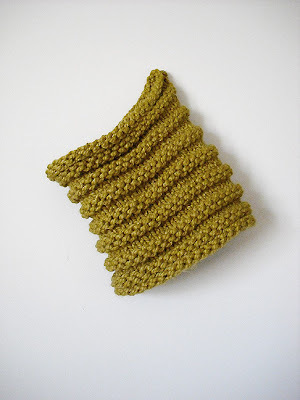 This took me about one evening to knit, and then I let it sit for about four weeks without weaving in the ends. But, last week I bought a new jacket thanks to the super clearance sales going on everywhere, and I needed a new accessory to match it, so I finally finished my cowl. I love how it turned out! It stands up well, it is reversible, and is snug enough around my neck that it isn't bulky under my coat. I've now got the pattern finished!! Check it out at my Etsy Shop! That's so cute! Perfect for windy illinois. 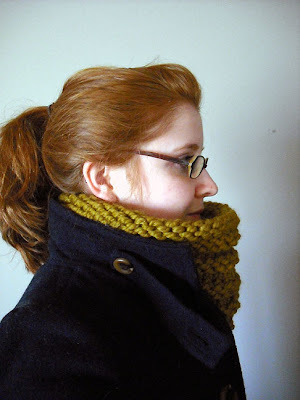 I love that chunky cowl, it looks so soft and comfy and stylish!! Great job. 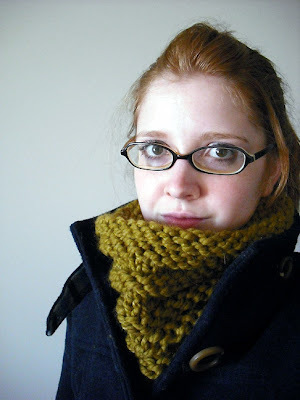 Great cowl, where can i find the pattern?